To see more photos look in the "Buddy" folder in the "Digital Photo Album". 8 Nov 01: Buddy gets a new bedroom! See the picture of his new home. 16 June 01: Cathy is able to put Buddy's harness on by herself! Good Buddy! Good Cathy! 10 June 01: Buddy wears the leash on his harness for the first time! Buddy didn't seem to mind the harness today or the leash attached. He even tried to fly away but he didn't get too far and when he got to the "end of his rope" he didn't even screech. What a good Buddy! 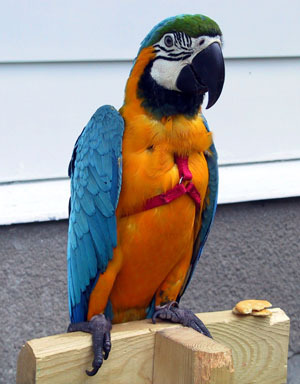 9 June 01: Buddy goes outside with his new harness! After two days of "familiarization" with his new harness Buddy let Cathy and I put it on him! And yes it is a two person operation. We went outside so that he will associate his harness with going outside as he appears to really like the backyard. Buddy wore the harness for about an hour before noticing that he could chew it. 28 May 01: Buddy visits Thomas's school in his new car carrier. Buddy didn't mind the kids in Thomas' class but he was not too happy about his transportation! 30 Apr 01: Another Buddy First - First time in the back yard! 29 Apr 01: Buddy takes his first trip to the pet store "Critter Jungle". 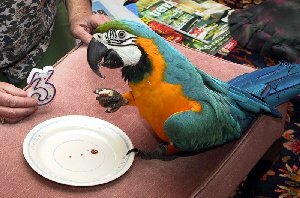 That is where we took our parrot handling course and everybody just had to meet Buddy! Of course we bought him a new toy for $40.00 which looks like a string mop head with pieces of coloured wood tied into it! We ordered a car carrier (the size we needed was not in stock) as he has figured out that he can chew through the side of the laundry hampers we are currently using! 18 Apr 01: Karl and I (Carl) have finished Buddy's new play gym. He seems to like it as he can chew it and throw his toys off of it from the top! He even used the ropes to help climb up although I don't know how long the ropes are going to last! 17 Mar 01: Buddy is getting more and more familiar with the family. This morning he sat with me and Cathy and watched part of a Jerry Lewis movie. He seemed a bit nervous about being in our Rec Room (or was it the TV?) but I am sure that he will get used to it. 10 Mar 01: Well potty training is going pretty good. Buddy just did about 4 straight poopies on the paper instead of on us! We are also starting his speech training. 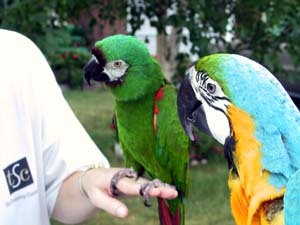 Lastly, tomorrow it's off to "Parrot Handling Class" at the pet store for Thomas, Karl and Carl. Hope we don't have to change any bad habits already! 9 Mar 01: Mom buys Buddy his first new toys! 5 Mar 01: Dad gets the call from the Vet: Elfie is a Boy! We had previously decided that if it was a boy we would change the name to Buddy. 4 Mar 01: Dad takes Elfie for its first shower. She seems to like it but it is her first time so we will have to see how the next time goes. Dad then spends some time with the blow dryer turning the "wet rat" back into a beautiful bird! 3 Mar 01: Dad has the bird rolling around on the floor playing like a dog! 2 Mar 01: The Vet calls and gives Elfie a clean bill of health! 28 Feb 01: Elfie has her first Vet appointment. Samples are taken for tests including a DNA sexing. 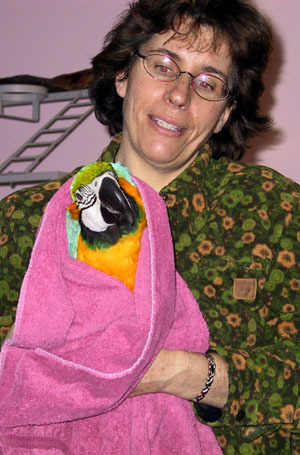 She receives a vacination as we have two budgies and they can carry a disease fatal to baby Macaws. 26 Feb 01: Elfie's name is expanded to "Elfie Costa Lotta"! 25 Feb 01: After much debate and calling around we decide "what the h*ll" lets go buy the bird! 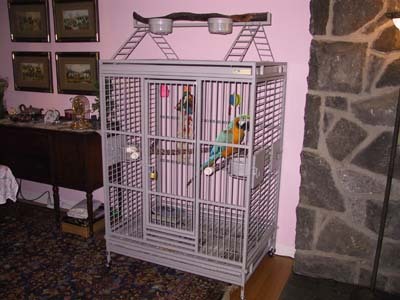 After disassembling the cage and loading it into the car, Costa is put in a travel cage made from two laundry hampers Cathy had bought at Zellers. During the drive home we decided on the name "Elfie" as the girl in the pet shop thought that it was a girl. The bird has a good trip sleeping on its back for a good portion of the time. 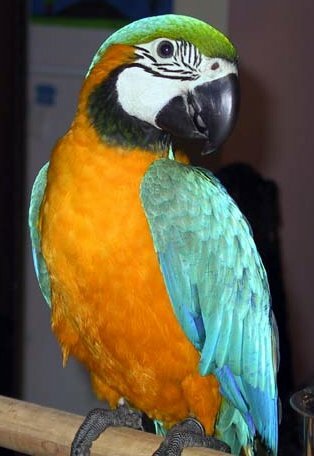 24 Feb 01: After a chance encounter with one of Ma Kettle's neighbours at Burlington Mall we check out the pet store and find "Costa". Buddy's Room A.K.A. "The Lockup"